Long Beach, Calif. – October 11, 2015 – Formula DRIFT presented by GoPro finished the 2015 Pro Championship and World Championship season at Irwindale Speedway. Fredric Aasbo in the Rockstar Energy Drink / Hankook Scion tC had a successful evening winning the final event of the season, while taking both the Formula DRIFT Pro Championship and inaugural World Championship. Round 7: Final Fight showcased tremendous action to a sold out crowd at Irwindale Speedway. Drivers had to adjust to a new course configuration which created a new dynamic to the competition. Close to 400,000 viewers tuned into the Driftstream to watch the Finals weekend. Aasbo entered the event with a significant lead in the points standings, yet was able to keep his cool and drive consistent throughout the night. As the event unfolded, he was able to clinch the Pro and World Championship by moving on to the Top 16 competition creating a significant point margin that could not be overcome. Aasbo met with Hankook and Scion Racing teammate, Ken Gushi, who sat in second place in the standings, in the Finals. Aasbo edged out Gushi to take the win and make a clean sweep for the weekend. Gushi finishes the season in second place overall, his highest finish in his career. Number one qualifier, Forrest Wang, in the Get Nuts Lab Nissan S15 rounded out the podium with a third place finish. Two-time Formula DRIFT champion, Chris Forsberg in the NOS Energy Drink / Hankook Nissan 370Z finishes the season in third place overall. The night was successful for Scion and Hankook as they finish with the Manufacturer and Tire Manufacturer season championship. Scion also finished one and two in the event and overall for the season. 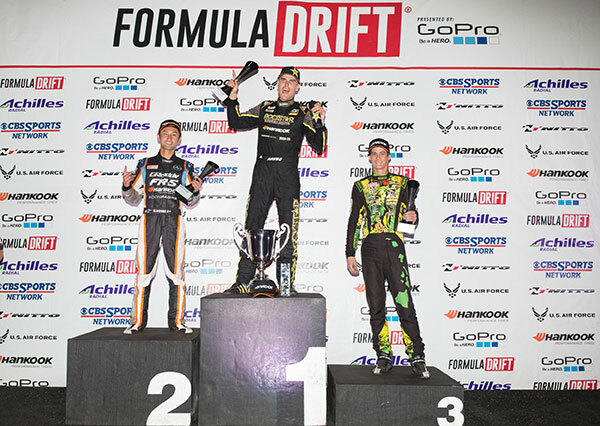 Hankook finished successfully with a first, second, and third place finish in both the event and overall championship, making for the first podium sweep for the tire manufacturer in their Formula DRIFT history. For more information visit: www.formuladrift.com and find Formula DRIFT on Instagram, Facebook and Twitter. Tune into Formula DRIFT on CBS Sports and check your local listings for airtimes.